The global automated optical inspection systems market has been touted to receive a commendable boost from the escalating demand for advanced printed circuit boards (PCBs) & surface mounted technology (SMT) in several consumer electronic products. Advanced electronic devices and machines seemingly require high-performance, high-efficient, tested PCBs to meet the manufacturing and safety standards, which is fulfilled by the deployment of automated optical inspection systems. These systems also bring forth tactical advantages to electronics manufacturers with fast, automated, cost-effective inspections before undergoing assembly procedures. Moreover, the product offers a flexible technology for controlling processes and pinpointing board defects – thus, the increasing standardization across the globe to develop safe and well-equipped machines for various industry-specific requirements will drive the global AOI system market in the years ahead. Reportedly, AOI systems are one of the fastest growing product verticals in the electronics manufacturing industry. The product has achieved unprecedented growth because of its affordability and efficiency. Undoubtedly, the driving force behind the AOI’s revolution is human inefficiency. Human quality inspectors unintendedly make errors, which is evident by the high rate of returned materials, post human inspection. Moreover, ever shrinking component packages have made it virtually impossible to inspect for manufacturing defects with the naked eye. i.e. 0.3mm (12 mil) pitch QFP’s, 0402’s, 0201’s, 01005’s etc., eventually making manual inspection a really slow and time-consuming process. On account of the limitations of time and money, manufacturers often face difficulties in developing high-quality printed circuit board assemblies (PCBAs). In a bid to tackle the rising trends of component miniaturization and lower profit margins, PCB manufacturers are adopting automated optical inspection systems to achieve consistently high quality on a budget. Unlike manual visual inspection, AOI is fast, accurate, repeatable, and automated, identifies more defects and increases manufacturers’ yield of good boards. In addition, automated optical inspection also produces measurement and attributes data for statistical process control and analysis, offering information needed for constant process improvement to eliminate defects before they occur, factors that encourage manufacturers to adopt AOI to compete in the intensively fierce electronics market. Incidentally, modern automated optical inspection systems possess sophisticated vision algorithms, multiple, broad optical data pathways and accurate mechanical and optical systems and can deliver on the simultaneous promises of high speed and high reliability detection. The product is also capable of detecting component presence / absence, polarity, and proper component markings, as well as providing exceptional post reflow solder inspection capability. As per sources, solder defects typically account for at least 70% of PCB manufacturing defects and can effectively be identified by today’s advanced automated optical inspection machines. The aerospace industry is one of the chief end-users of automated optical inspection systems market due to rapidly growing demand for cutting-edge weapon machinery and reliable and accurate equipment controllers. A material fault and weakness could lead to destructive results for people commuting through airlines as well as the ones in close proximity, eventually leading to a high death toll and loss of millions of dollars. To avoid these repercussions, aircraft manufacturers are required to deploy efficiently PCBs and inspected components. The AOI systems can effectively be used by aircraft manufacturing for reliable component testing and supporting the non-destructive development process. For instance, U.S. adhesive manufacturing company, Nordson has recently developed a range of automated optical inspection systems that meet the highly precise demand of the aerospace industry. Flextron Circuit Assembly has also added Automated Optical Inspection (AOI) and 3D Solder Paste Inspection (SPI) capability to its PCBA manufacturing lines in a bid to better the reliability and quality in its electronic assemblies. The U.S. covers a significant proportion of automated optical inspection systems market share due to the adoption of technical advancements across all manufacturing sectors. The presence of numerous safety and obligatory inspection standards for machinery production in the region also accounts for the expansion of this industry. Incidentally, the consumption of automotive and electronic products is more in the U.S. as compared to other regions due to high disposable incomes and increased affordability. Aided by the rising concerns for the development of safe, high quality electronic components and the demand by PCB manufacturers for systems equipped with advanced features such as quick fault detection, PCB production line analysis, and 3D images, U.S. automated optical inspection systems market share is certain to depict an upsurge in the years ahead. Indeed, powered by the U.S. being a major regional contributor, North America has been touted to account for a significant 30% of AOI system market share by 2024. 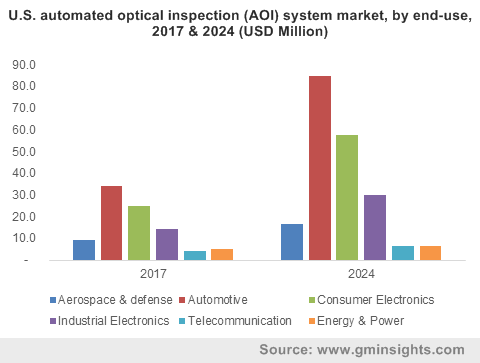 Increasing awareness related to reliable and accurate electronic component development will drive the growth of automated optical inspection systems market in the future. Prominent contenders are reportedly focusing on offering high-quality inspection machines that eliminate issues in error detection and limit human intervention in PCB production. Technological advancements in the automated optical inspection systems development is also expected to help PCB manufacturers save operational and production costs by offering machines that perform detection operations at every component production and assembly, which would further catalyze AOI system market trends in the years to come.